The Oregon Region's $47-million Ilani Casino Project is Complete — Goodfellow Bros.
Ilani Casino is the premier destination for gaming, entertainment, retail, and dining in the Pacific Northwest. In September, GBI wrapped up the two-year, $47 million Ilani Casino Resort project located in La Center, Washington. 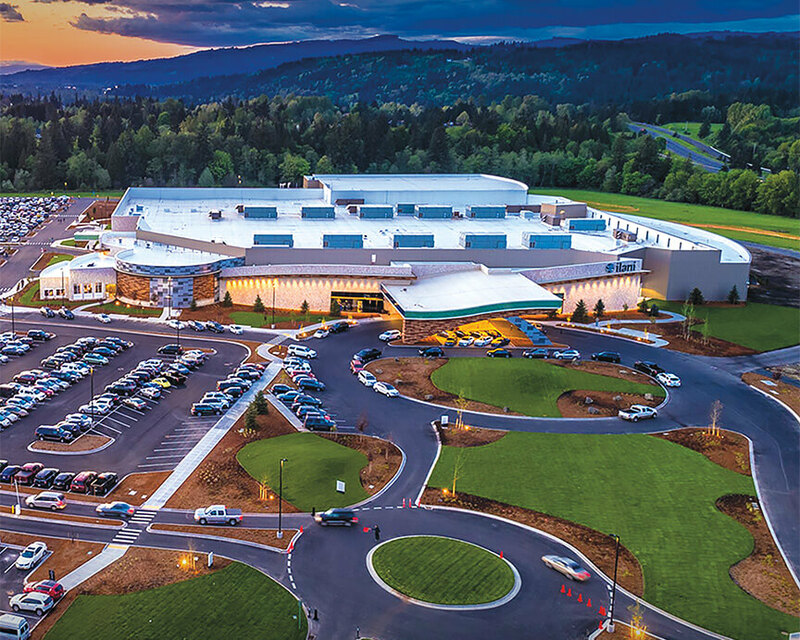 Developed by Salishan-Mohegan LLC in collaboration with the Cowlitz Indian Tribe, Ilani is marketing itself as the premier destination for gaming, entertainment, retail and dining in the Pacific Northwest. Located 25 miles north of downtown Portland, the 354,000-square-foot casino opened for operation on April 24, 2017. GBI completed all the site work on this 152-acre development, including infrastructure, utilities, grading and paving, as well as the removal and replacement of the La Center Interchange over Interstate 5 that required coordination with the Washington State Department of Transportation (WSDOT). The Cowlitz Tribe financed the entire freeway interchange to handle the increased traffic from the expected 4.5 million annual visitors. Therefore, the Tribe dictated the schedule; a typical project of this nature managed by WSDOT would take 12 to 14 months to complete, but the Tribe wanted it done in nine to ensure a grand opening in April. GBI was up for the challenge and assembled day and night crews, working six days a week through what would become one of the wettest winters on record. They battled weather to ensure quality, which required careful coordination and installation of materials. Wet and cold weather protection was used almost throughout the entirety of the interchange’s construction.